50 Artistes and technicians have arrived directly from China and are working on the installation of 600 gigantic Chinese lanterns in the form of exotic animals, a 70 meter long dragon, flowers, temples, etc., and even a copy of the chateau in 35 sites in the formal french and english gardens. One of the most impressive is the representation of the Blue Temple in Beijing/Peking - over 22 meters high, it is taller than Thoiry's Castle ! You will enjoy also the theatre spectacle de Masks de Sichuan, and the Arts and Crafts Market with artists and craftsmen direct from China will create their traditional arts before your eyes ! 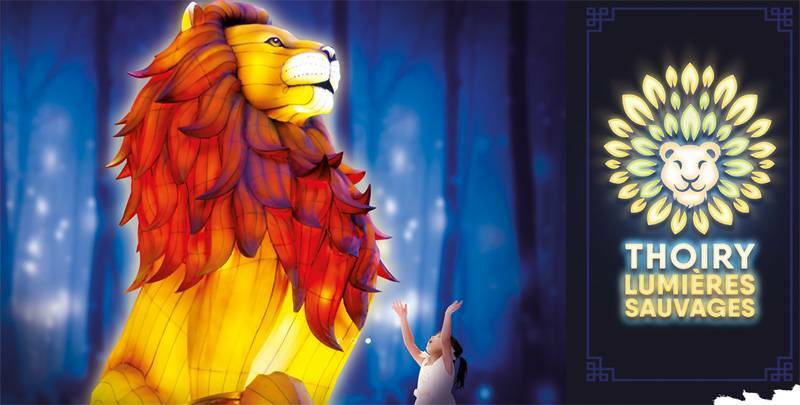 This enchanting Lantern Festival will be open for the delight of visitors at sundown 3 to 4 nights per week from Saturday, October 28, 2018, to Sunday, March 10, 2018 ! And that's not all ! In Thoiry's magnificent chateau on certain evenings, VIP guests may enjoy a dinner with the Count de La Panouse in the State Dining Room !